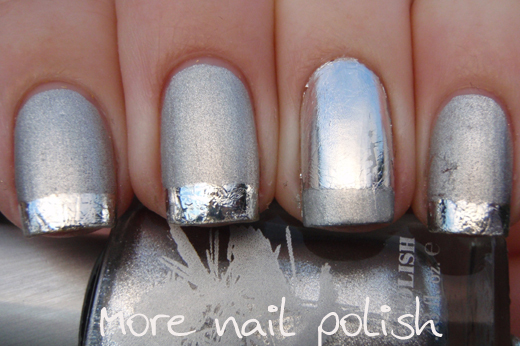 Wow, what a fun couple of days with all those gorgeous Picture Polish shades plastered all over the blogosphere. I loved reading everyone's reviews and seeing their beautiful swatch photos. Now onto something completely different. Last week I did a matte gold mani with gold foil tips, and this week I tried a silver version, but this time with an accent nail. I don't like wearing silver as much as gold, but this was still very eye-catching. 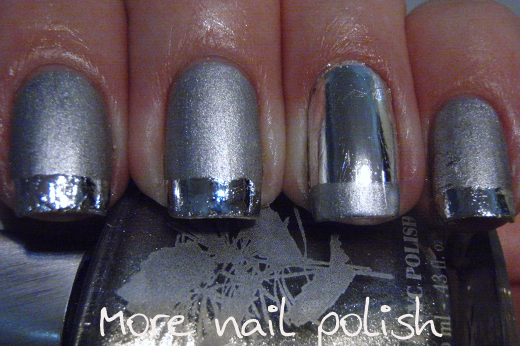 The base on the three matching finger is Priti NYC Old Man Cactus (silver foil) with Essie Matte About You top coat. 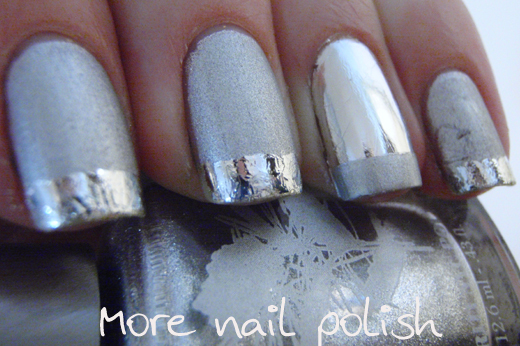 I then applied nail foil glue to the tips and put on the foil. The tipse do have top coat, and they wrinkled a little bit, but they need the top coat or they just wash off almost the first time you wash your hands. For the accent nail, I decided to try something different. 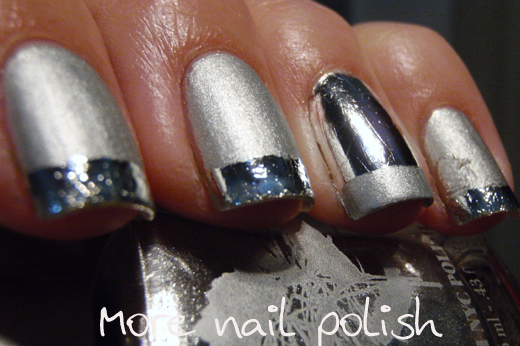 Instead of using a nail foil I applied one coat of Layla Metal Chrome so I had a good shiny background. I then applied a top coat and waited until it was nearly dry. I then use a fanned brush and applied some silver leaf. The stuff I used was Monte Marte Imitation Silver Leaf. I got a pack of ten sheets for less than $5 from a local craft shop and this only used a nail size amount off one sheet. It was really easy to smooth it out on the nail because it is so unbelievably thin and feather like. I just used the brush to push it down and smooth it out across the nail. 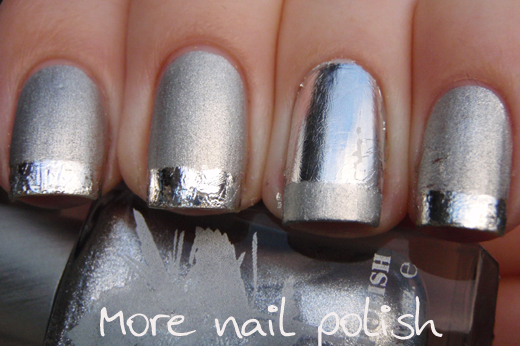 To finish off the mani, I applied the matte top coat over the tip of the silver leaf. Before I did this mani, I tried a test finger to see how it would work. I applied a top coat to that test finger and found that it wrinkled really badly. 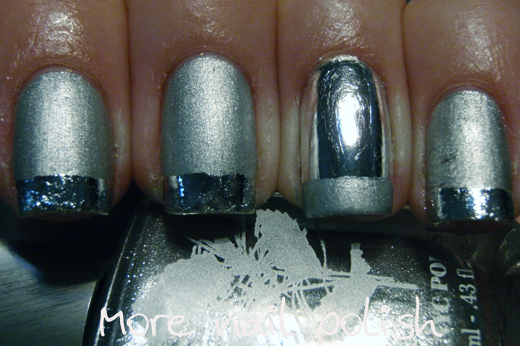 Because of that I decided not to put top coat on the silver leaf nail, and by the end of a full day's wear it had pretty much worn off. But because I put a layer of Layla Metal Chrome underneath it wasn't too noticeable. Actually, some of these photos were taken a few hours later than the others, and you can see where some of the silver leaf has worn off on the top of the nail on the side closest to the pinky nail. 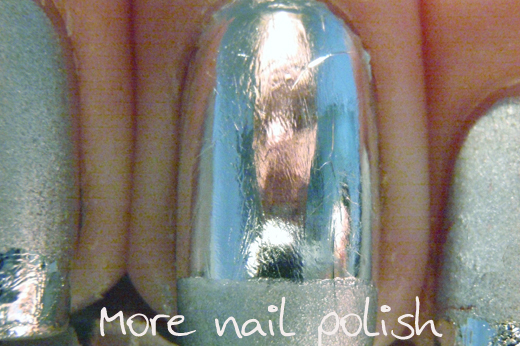 I ♥ foil... only if I could find a top coat that doesn't make it crinkle so bad!!!! This is very pretty! I can't believe how shiny that silver leaf is I've never seen them in sheets only all broken up. It's too bad the topcoat ruins it. This would be great for New Years or a holiday party though!